Traditionally at weddings, guests are given little packets of sugared almonds. Apparently there's a reason for this: almonds are slightly bitter but with the sugary coating, they represent the hope that married life will be more sweet than bitter. It's also traditional to give five almonds exactly, as the number five can't be divided so symbolises a strong bond between the couple. 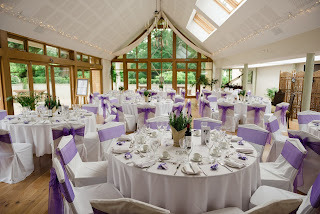 Having said that, I've been to enough weddings where the sugared almonds get left behind - I'm not sure how many people actually like eating them. 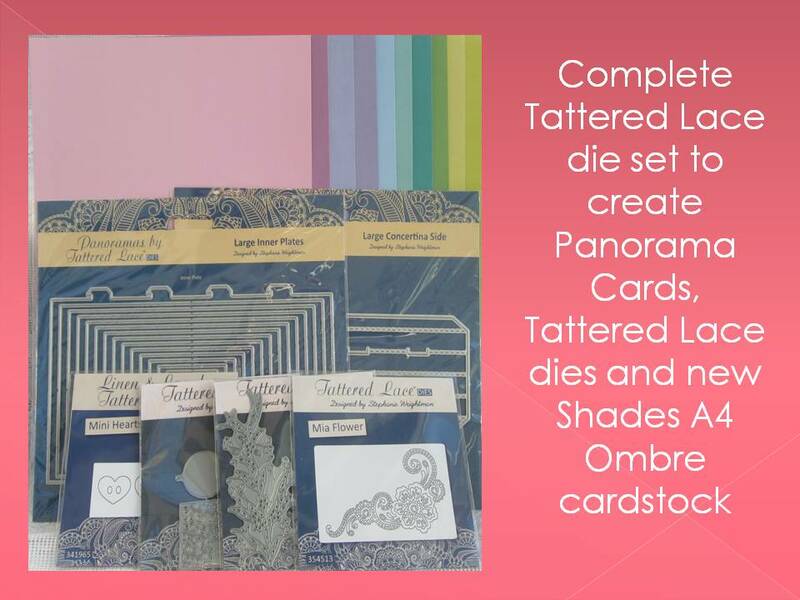 We weren't on a tight budget for our wedding but I didn't want to spend money on things that we didn't feel were worthwhile, so we considered not giving out wedding favours at all. 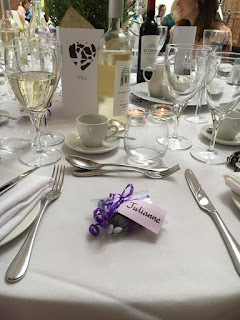 We also considered charity wedding favours, as we wanted to support the Young Epilepsy charity and I knew that some charities sell kits where you can make placecards for the table and each one has a little pin badge, like the pink ribbon breast cancer logo. 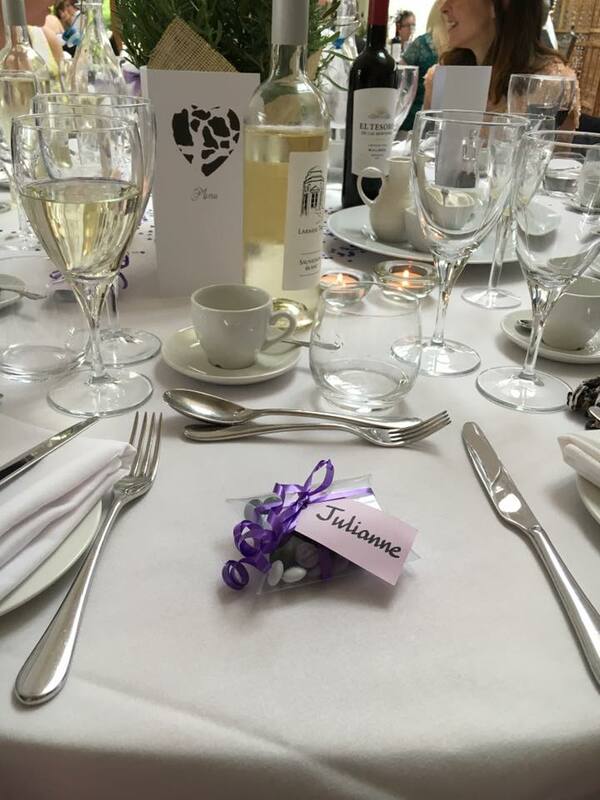 At the time Young Epilepsy only had plastic wristbands and we weren't sure if they would be suitable so we decided instead to make a donation to Young Epilepsy which we put on our gift list and wedding website, as this would raise awareness and we could give more money this way. I decided that I wanted to combine the guest placecard with a little gift or wedding favour, and for it to be homemade, at least partly. I came across a website where you could personalise M&Ms and they had a 25% discount and when I explained to my fiancé, he loved the idea. We could get M&Ms in our wedding colours, printed with pretty much whatever we wanted. 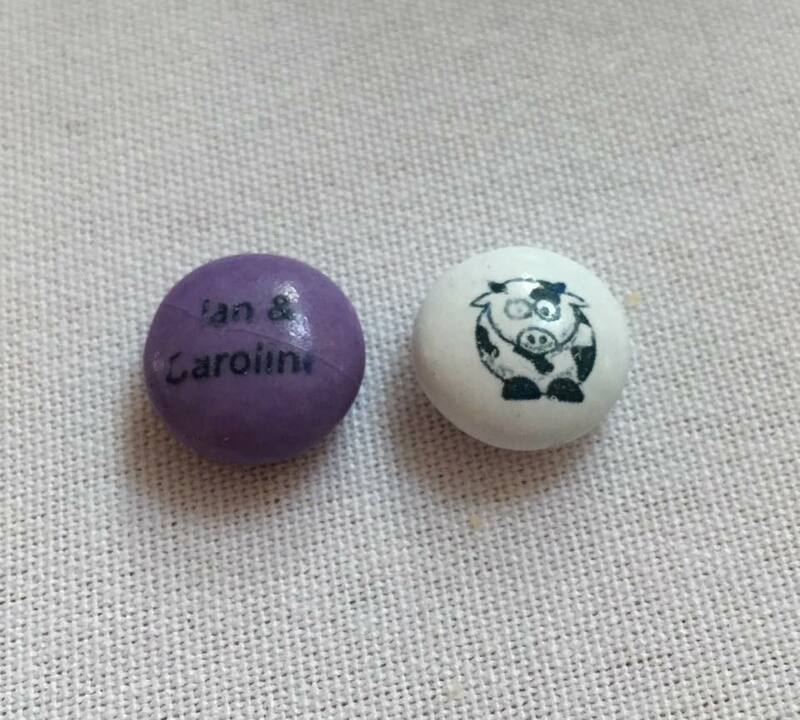 We wanted to go for a cow theme so decided to have a little clipart cow printed on half the M&Ms and our names printed on the other. They can't print on black so we had white and purple (as the bridesmaids dresses were purple) and then separately went to the M&M World shop in Leicester Square (easy enough as we both work in London) to buy a big bag of black M&Ms. They have sweets in every colour imaginable and you can mix your own combination and we couldn't find anywhere online selling just black ones so my fiancé went and did it himself. I bought clear plastic 'pillow' gift boxes for about £12 for 100 on Ebay, so we weighed the M&Ms and worked out how many we could have in each packet, and spent an evening filling the packets. We used my die cutting machine to cut out gift tags from purple card and my mother-in-law, who does beautiful calligraphy, kindly agreed to write the name of each guest on the label. I then took some purple ribbon, which I already had in my craft cupboard, and tied it around each M&M packet, attached the name label and used a pair of scissors to curl the ends. We bought the M&Ms as a bulk bag of 1.5kg which cost £85 before the 25% discount; you can also buy a bulk bag of 1.5kg and 100 pillow boxes for £105 but I don't think they offered this at the time and in any case it was cheaper to get the boxes from Ebay. You can also buy plastic hearts which are £119 along with the 1.5kg of M&Ms and we might have considered this had they been available at the time. I costed them out and we made each one for about £1 which is really good - if you look at websites selling wedding favours you can easily pay £2-£3 for nice ones, which doesn't sound a lot but when you multiply that by 75 guests - we ended up spending around £75 rather than £225 which is good! 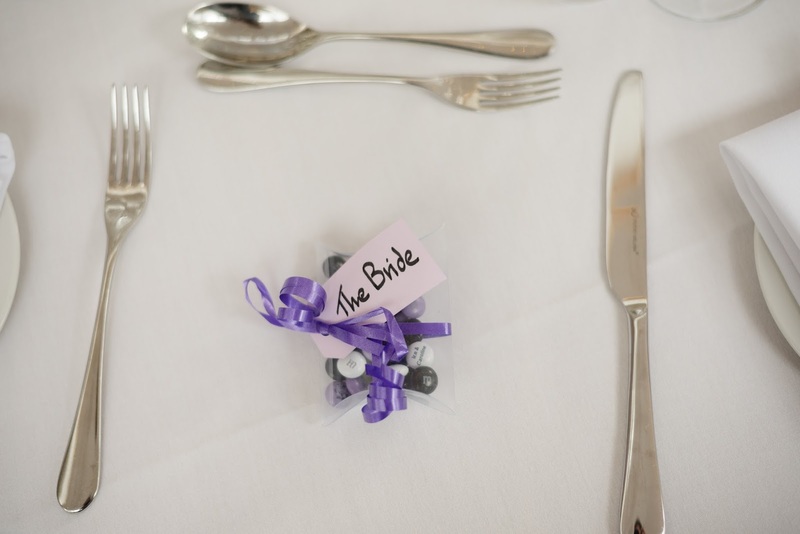 Each packet was left on the dining table on each place setting so guests knew which was their seat. 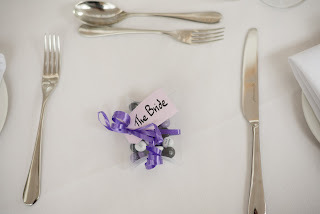 I think some people ate the M&Ms at the table and other people took them home - I hope they liked them, I think these were a bit quirky and fit really well with the theme of our wedding - if you want to read more about it, click here!